I read this book with my daughter who chose it as her Historical Fiction book report read. Each of us checked out a copy from our local library (shout out to the fabulous Johnson County Public Library) and each day I would make sure to read as many chapters as she did so we could spend part of our evening discussing what had taken place. 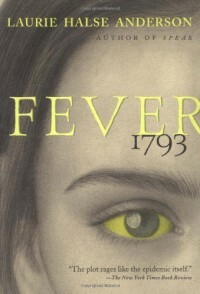 Not only did I love this experience with my daughter, but I loved that Fever 1793 was the book with which we started this new tradition. It was a fun, yet educational read and the first book in a long time that my daughter has truly gotten excited about (yay - that makes a bookworm mom's heart sing)! This story, based on the events of the Yellow Fever epidemic in 1793, blew my socks off. Using Fiction to liven up a historical event to teach our kiddos about a very significant portion of American History is simply awesome, and I was captivated by it as well. I've seen a couple reviews that mention it is not written in a way that would make it appealing to us old folks. To that, I say SHUT YOUR MOUTH (just kidding - we all have our opinions). In all seriousness, yes it is written in a way to make it appealing to adults. The characters are well developed and show much growth throughout the story - I really felt like I connected with them and I think my daughter did to (judging by the conversations we had at night - she really personalized them). The storyline is factual and detailed, yet written in a way to keep children interested and learning. That isn't to say it is so simple you feel like you're reading an infant's board book though. So while the book is indeed written for the teen and pre-teen crowd and, therefore, should be written to their level, it is also an intriguing and thoughtful read for the adults that choose to give it a chance. Now, for the 6th grader's review - she gave it 5 out of 5 stars and said it was "awesome"! My dear daughter thought it was one of the best books she's ever read. I can vouch for that review because she eagerly discussed this book with me every evening and never complained about having to spend part of her free time reading it (she is a very reluctant reader; especially when it comes to assigned reading). She thought Mattie was courageous, and she was very entertained by King George the parrot. For parents, teachers, or other caregivers looking for a fun, but also educational read, grab this one. Or if you're looking for a book to read with the children in your life, pick this one up. It worked for me and my reluctant reader!